Click here to see the list of audio hardware reviews and measurements. In a recent review of this phono stage, there was some discussion of the approach taken for measurement and interpretation of phono stages. This post is a follow up with additional measurements which I (and other designers and users of phono equipment) find necessary for evaluation. This a "in addition to" rather than "instead of" for Amir's review, but I'd like to not only present measurements, I wish to also go into the whys and hows of things which are peculiar to the genre. And I'll start things out by thanking Amir for sending the unit to me, as well as @dinglehoser who volunteered his unit to let me dissect its performance a bit. As usual, my test setup is centered on an APx525 analyzer, but I also pressed into service a Hewlett-Packard 3466A volt-ohm meter and a Kikusui COS6100M 100 MHz scope. This is a review and detailed measurements of Klipsch PowerGate Multifunction streaming power amplifier, DAC, Bluetooth and phono preamplifier. It normally costs USD $499 but for some reason it is on Amazon for USD $150 including Prime shipping! This puts the PowerGate in direct competition to SMSL AD18 and Topping MX3. The buttons and rotary control have good feel though. Strangely the LED bar showing the level only goes 2/3 of the way up on the left and not all the way around. There is a headphone jack which I will be testing in the review. This is a quick overview of how class D amplifiers operate. Note the “D” does not mean “digital”; it is simply the next letter in order as standards bodies enumerated amplifier types (A, B, C, D, E, F, G, H, I, etc.) It takes an analog, not digital, input and produces a pulse width modulated (PWM) output. I apologize in advance for the length. This is a review and detailed measurements and comparison of SMSL AD18 DAC, Headphone Amplifier, Power amplifier and Bluetooth Receiver. I will be contrasting its performance against the Topping MX3. I purchased the AD18 in February of last year through Amazon. Seems like the price has gone down to $140 and it now includes Prime shipping. Topping MX3 is still cheaper at $130 from Amazon. I left the screen protector on so that if I sell it, the next owner can have the satisfaction of taking it off. I wish the volume indicator was displayed in large font instead of the small values in top corner. This is a review and detailed measurements of the Topping MX3 DAC, Bluetooth, Headphone Amplifier, and Power amplifier. You even get a remote control with it. Despite all that functionality it costs just USD $130 from Amazon including Prime shipping. I bought mine from Massdrop 10 months ago. I don't know what I paid but likely less. It has the same design language as the Topping DX3 Pro but even more attractive with that slanted logo. The volume control is digital and very sensitive. There is a ton of functionality here which I won't go into as there is a good review of it from Z which I will post after this review. Suffice it to say, it is very feature rich and well designed for such a bargain product. This is a review and detailed measurements of the Ayre CODEX balanced DAC and headphone amplifier. It is on kind loan from a member. The CODEX is a current product but seems like it was released 3 or so years ago. It costs USD $1,795. If you are not familiar with Ayre, it is a US company and is probably best known by its late founder, Charles Hansen. He has been active on forums for years. The company is in high-end audio business so my expectations were high on this DAC and headphone amplifier. Then again, closeness of the mains input gives me some pause regarding its noise immunity for the RCA outputs. This is a review and detailed measurements of the Acoustic Power Labs APL1 digital audio signal processor. It is on kind loan from a member. The APL1 comes in a number of formats. The one under review is the automotive version and costs 510€ or USD $570. This is for the bare hardware. Software that let you program its internal "FIR" filters costs 262€ or USD $295. I am surprised that given the cost of the hardware, the software is not bundled in for free. For this testing, I only focused on the measurements of the hardware as the software seems non-trivial to use. The LEDs change color depending on where you leave the slider switch. In my case I set the switch to bypass. This is a review and detailed measurements of the Cyrus soundKey portable USB DAC and headphone amplifier. It is on kind loan from a member. It costs USD $98.99 from Amazon with prime shipping. It comes in a few colors. I received two short USB cables, one of which you see in the picture above. I don't know if that is how Cyrus ships it or the owner sent it me as such. There are no volume controls so you would be relying on your software player for that. One of the differentiators for the soundKey is low power consumption according to the company. I will be measuring and reporting on that later in the testing. For now, there was no rise in the temperature that I could feel on the unit. This is a review and detailed measurements of the Lounge Audio LCR MKIII Phono stage (amplifier). It is on kind loan from a member. The LCR MKIII costs $300 from the manufacturer direct. A touch of class is intended to be provided by that lexan sheet with blue LED. It doesn't do much for me especially since the lighting is not uniform. Since this is a moving magnet only phono amplifier there are no switches or controls. We have our simple RCA in and out plus a ground lug. Power is provided through an external AC adapter which is not a bad idea to keep mains inductance from the transformer leaking into sensitive amplifier stage. This is a review and detailed measurements of the Lake People G109-S headphone amplifier. It is on kind loan from a member. It costs USD $520 as of this writing but I see it has been offered on Massdrop for lower price. I saw the anniversary edition (?) with gold letter and larger feet and that looked better. I know enclosures are expensive but over $500, I like to see a more professionally designed writing, logos, etc. The volume control is analog but has notches in it. There are two headphone out jacks but they are identical (unlike some others where one is lower gain). I would have wished one was 3.5mm to accommodate IEMs without adapters. This is a review and detailed measurements of the vintage Dynakit Dynaco Stereo 70. It is on kind loan from a member who bought it used online and repaired it. Previous owner hand upgraded it but could not get it working. Some of the online samples I have seen are a lot more crusty. The unit I received came from matched pairs of tubes from Apex. While each pair had the same parameters, the ones for each channel varied quite a bit. As you will see, this is reflected in the measurements. There is a single bias control for each pair of tubes which is not optimal. I went ahead and adjusted both for 1.56 volts as stated in the manual. This is a review and detailed measurements of the Audioengine D3 portable DAC and headphone amplifier. I bought this refurbished from the company direct a year ago. I think I paid USD $99 for it but now see it new for the same price from Amazon including shipping. A member wrote to me asking if my version was 2 or the original. His has v2 after it, mine does not. I contacted the company and just heard back that the new versions have lower output impedance than what I measured. They do not note any other changes. On the back side there is full set of regulatory certifications including CE and FCC which I was pleased to see. And yes, the CE logo conforms with the EU graphics standard. Audioengine is big enough company that likely did go through proper testing. The metal enclosure definitely helps with any radiated emissions standards. This is a review and detailed measurements of the Schiit BiFrost audio DAC. The unit is on kind loan from a member. The one I have doesn't have USB input so not sure if that is an older version or current??? Schiit website shows USB input as standard but then again there is some wording regarding optional USB module. Regardless, as best as I can figure out, the cost for BiFrost is USD $399 plus shipping. Note that I had previously measured the Schiit BiFrost Multibit. This is the non-multibit version which is based on AKM DAC chip. Since there is no USB input, the momentary switch toggles between Toslink and S/PDIF. I used the latter for all of my testing. This is a review and detailed measurements of the Oppo HA-1 DAC and headphone amplifier. It is on kind loan from a local member who literally flew to our nearby airport to deliver it to me! The HA-1 is discontinued but it cost USD $1,199 when it was being sold by Oppo. I just searched on ebay and was surprised that it goes for $1,200 to $1,700!!! Will this be a top find as the Oppo UDP-205 UHD player was? We will find out. I wish all DACs/headphone amps above $1,000 came with such a display. This article is to expand upon earlier discussions about reflections and their potential for harm in a digital transmission system as applied to the audio world. I will be qualitative as much as possible, but numbers are bound to creep in. This is also not meant to be a rigorous analysis, more a hand-waving explanation to help folk see what is happening in their system. First consider a digital driver (source) and load (receiver) connected by a transmission line (cable). 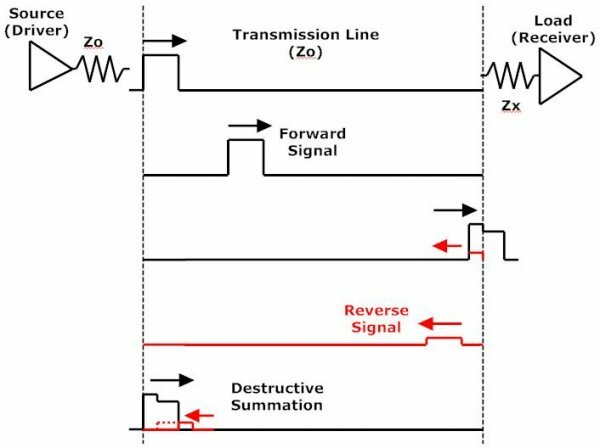 The driver and cable are matched with impedance Zo, and the load has mismatched impedance Zx as shown in the figure below. At the top, a single pulse is launched from the source toward the load. The pulse, now a forward signal, travels down the line to the receiver. Even at nearly the speed of light it takes a little time to get there.